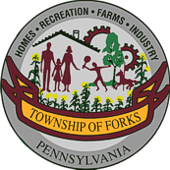 Forks Township is accepting applications for a monitor to work at the Community Center. Applicant must be available to work days, evenings and weekends. This is a part time position which requires answering phones, customer service, monitoring events/programs and other general duties as needed. In our attempt to "Go Green" - resumes will be accepted electronically as well as hard copies. Forks Township is an Equal Opportunity Employer.